As many of you know, I was really sick last week! Not gravely ill, but definitely sicker with something flu-like than I have been in years and it's taken me a long time to get over it... Close to 2 weeks later and I'm still not feeling 100%, but definitely better. While I didn't have much of an appetite during the worst of it (a sure sign that this foodie is sick), once it came back I was craving comfort food. And for me, the ultimate comfort food is pasta. Whether it's something elaborate and homemade or something as simple as noodles with butter and Parmesan, no other food is guaranteed to make me feel better like a warm bowl of pasta will. When I mustered up the energy to get back into the kitchen at the end of last week, I surveyed our pantry and found it was quite full given all the ingredients I had no energy to cook with all week. The end product was a delicious and hearty pasta dinner ideal for making any sick or empty belly happy! 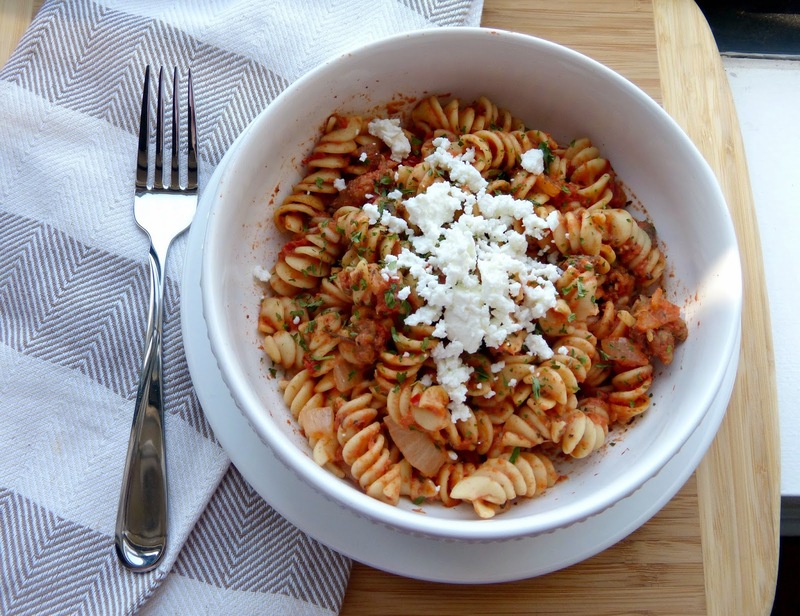 A simple tomato sauce is thickened with creamy goat cheese, which adds some really delicious and rich flavor. Add to that the heat and bold flavor of spicy Italian sausage, a little depth of flavor from white wine, and some simple seasoning and you have the perfect one pot pasta dinner. Heat a large saute pan over medium heat. Add sausage, breaking up into smaller pieces while it cooks. Cook until browned and cooked through, stirring often. Remove sausage with a slotted spoon and transfer to a paper towel lined plate. Add oil to the pan and swirl to coat. Add onion and saute for 5-6 minutes minutes, until onions are softened. Add garlic and saute for an additional 2 minutes, stirring frequently. Carefully pour the wine into the pan, raise the heat until wine is bubbly, and use a spatula to scrape up the browned bits in the pan. Reduce heat, add tomatoes and red pepper flakes, and simmer until the mixture is reduced by about half. Remove from heat, add the parsley and goat cheese and stir until cheese is melted and fully incorporated. 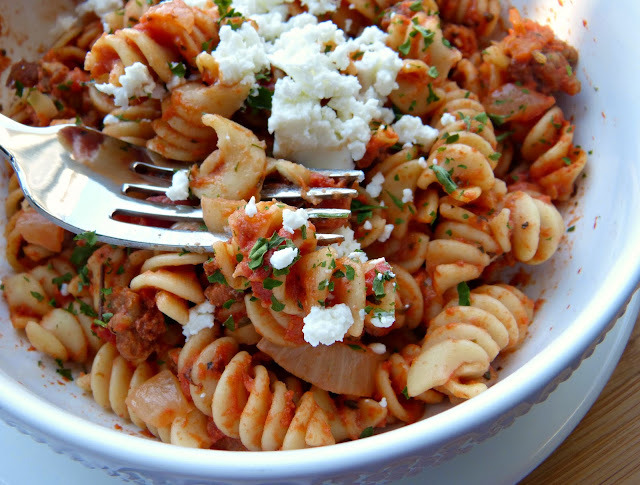 Stir in the reserved sausage and cooked pasta until ingredients are fully incorporated.